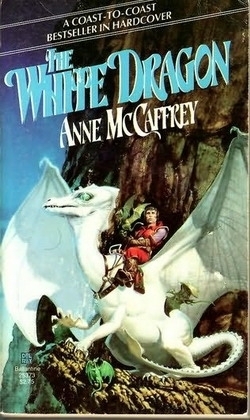 The White Dragon follows the coming of age story of Jaxom, the young Lord of Ruatha Hold, who had accidentally impressed the unusual white dragon Ruth in Dragonquest and Dragonsong. As Jaxom grows up, he has to deal with the difficulty of being both a Lord Holder and a dragonrider, the maturity of Ruth (who, besides being white, is a runt), his own teenage angst and desire to fight Thread on his own, and the rebellious Oldtimers, who attempt to steal a golden egg from Benden Weyr. Fortunately, Ruth always knows when he is and can travel through time to avert the growing political crisis. But while fighting Thread, Jaxom falls ill with a potentially deadly sickness called "Fire-Head". This leads him to recuperate in Cove Hold, and while there he discovers some of the mysteries that the Ancients, the ancestors of the Pernese, left behind, and he begins to make more sense of the past.